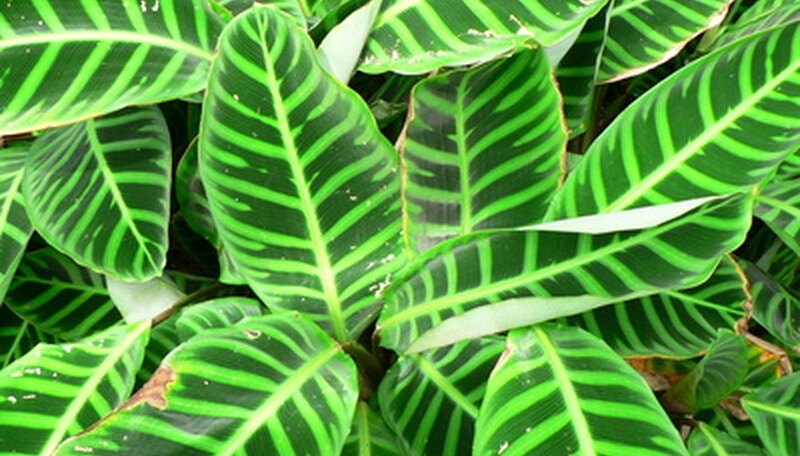 Calathea is a group of evergreen, tropical plants grown primarily for their foliage. Native to tropical South America, these are often grown as houseplants due to their warm temperature requirements, low light needs and showy, variegated leaves. There are over 300 species. They require consistency in their care. Calathea plants do not tolerate temperatures under 55 degrees Fahrenheit. They prefer steadily warm temperatures in the high 60s or low 70s. Keep these plants away from hot or cold drafts, such as those that come from heating or air conditioning vents or leaky windows. Plant calathea outdoors only if you live in USDA growing zones 10 or 11, which are tropical areas in the far southern part of Florida and a sliver of the southern California coastline. While calathea plants can grow in low light conditions, they also need some exposure to sunlight to produce the variegation on the leaves. Too much direct sunlight will cause the colors to fade and may even scorch the leaves. Home gardeners should place or plant calatheas where they will receive morning sunlight followed by afternoon shade, or in a window that receives bright but indirect light, such as one facing north. Calatheas should be grown in loose but organically rich soil. Well-draining soil is a must. A planting medium composed of two parts peat moss, two parts coarse sand or perlite and one part loam is ideal. Keep the soil moist but not waterlogged or soggy. Don't let water get on the leaves, because wet leaves can lead to the development of leaf spot, a fungal disease. Calatheas need high humidity to thrive. Place your plant in a humidity tray (a tray filled with pebbles and water). Or, mist it several times a day with a spray bottle of lukewarm water, but note that too much water on the leaves may lead to leaf spot. Fertilize the calathea every two weeks during the growing season (spring through summer). The University of Florida recommends a fertilizer high in nitrogen. Follow the application directions according to the label on the package as per the age and size of your plant. Calathea can suffer from root rot, which is a fungal disease that occurs when the soil is too soggy due to overwatering or flooding. Empty the catch tray of potted plants immediately after the plant stops draining, and keep the soil barely moist. Common insect pests such as aphids, mites and whiteflies can infest this plant. Knock them off with a strong steam of water, or use an insecticide to rid the plant of these bugs.